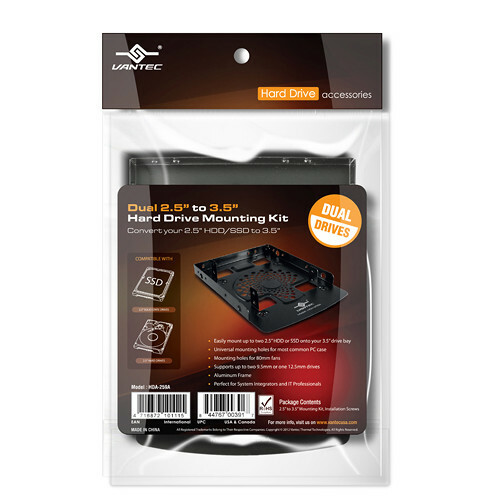 The aluminum Vantec Dual 2.5" to 3.5" HDD/SSD Mounting Kit lets you easily mount up to two 2.5" HDDs or SSDs up to 9.5mm thick in a single 3.5" drive bay. It also supports mounting a single 12.5mm-thick 2.5" drive. It features universal mounting holes and comes with screws for installation. Box Dimensions (LxWxH) 5.9 x 4.4 x 0.6"